How to Show Relationship Status on Facebook Profile? Click on “About” on your profile page. At the left sidebar of the About page, you will see “Family and Relationships” section. Just under relationship header, click on “Add your relationship status” or if you want to change the current one just click on Edit. Firstly select on “Relationship Status“. Just left of save changes button, you will see a little drop down menu. Select Public to display (Relationship Status) everyone or Select Friends to display only friends or Select Only Me to display only yourself or Select Custom to set people who will see your relationship status. There are some relationship status that you can use on this feature and there are also some custom options. We will mention about those below. Single: Means you don’t have any relationship with someone. In a relationship: It means you have an ordinary relationship with someone. Engaged: If you have a fiance or a fiance, you can select this option. In a civil union: This is for same gender couples and it is a situation like marriage. In a domestic partnership: It means Facebook user have a relationship with someone. He/She is living in the same home with the partner, they share same social life but they are not married yet. Open relationship: In an open relationship, people can have other relations in their lives. It’s complicated: If a Facebook user doesn’t sure about his/her relationship status, he/she can select this option. Separated: These are generally relations for those who are living apart of each. Divorced: These people were married but they have separated by court decision. Widow: This is for those who has lost their wives and husbands. Public: Anyone will see your Relationship status. Even those who are not your friends. Friends: Only your Facebook friends will see your relationship status. Only Me: One of the best options for hiding your status but yourself. This can offend your partner though. Custom: You can select who to share your status with this option. You will also select who to hide. 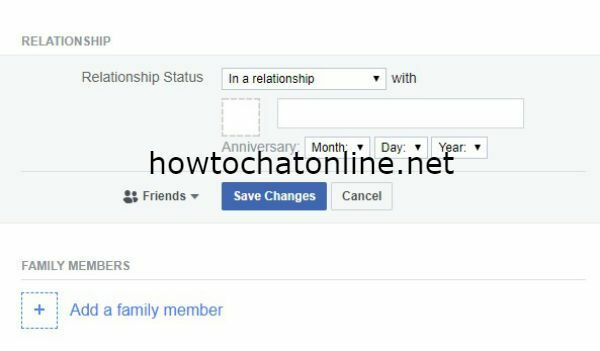 Recommended tutorial: How to Request to Be in a Relationship on Facebook?